Donald Trump continues to get his name in the headlines. He started out in the 1960s by taking it upon himself to turn a profit on an apartment complex in Cincinnati that had been foreclosed. He succeeded and left Ohio for the soon-to-be shinier glories of Manhattan. At the time, the financial crisis of the ‘70s had bestowed neglect and cheerlessness on much of the island’s real estate. But these dire circumstances would prove advantageous and immensely lucrative to The Donald, as he is more-or-less affectionately called. Trump would come to special public prominence a decade later thanks to his 1987 revitalization of Central Park fixture, Wollman Rink. The properties he subsequently purchased through his company magnified his public profile, but his personal real estate deals have also garnered public praise and abuse. That’s something Trump seems to relish, especially because it benefits his business. Multi-million dollar licensing fees, anyone? 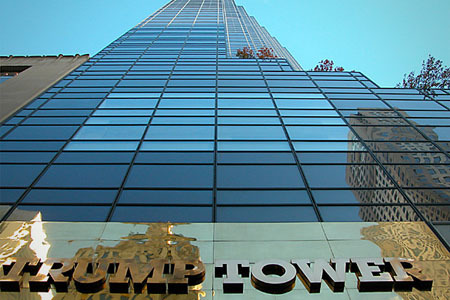 725 Fifth Avenue, or Trump Tower, is probably the first place Donald Trump calls home. The Tower’s three uppermost floors (or highest 30,000 square feet) comprise his apartment. He shares his building with one Saudi prince — with a correspondingly single floor allotted to him — and each year’s reigning beauty queen from the Miss USA, Miss Teen USA, and Miss Universe contests. Less prominent figures, of course, are also free to snap up a room or two of the building for themselves. Forbes magazine offers a $300 million value estimate of the property which has a Gucci store on location. Maison de L’Amitié in Palm Beach, Florida: Purchased by Trump in 2004 for $41 million; renovated with $25 million (at Trump’s behest) by “The Apprentice” Season Three winner Kendra Todd; and sold for $95 million in 2010. Mar-a-Lago in Palm Beach, Florida: A $10 million, 1985 Trump purchase that would host Michael Jackson and Lisa Marie Presley’s wedding celebration. Seven Springs Estate in Bedford, New York: Bought in 1995 for $7.5 million and site of one of Trump’s planned golf courses; residents objected and Trump turned it instead into a luxury homes development project — currently on hold. Trump National Golf Course in Rancho Palos Verdes, California: This Trump estate is selling for $12 million. There you have it folks — just another diverse investment portfolio of the rich and famous. And long-form or short-form birth certificates, even if Trump doesn’t make it into the Oval Office, he’s likely to continue making headlines and excellent profits on personal and company-owned real estate deals.